Homegrown Talent. Nothing quite develops a franchise more efficiently than developing draft picks that help contribute to the major league club on a consistent basis. Frankly, I do not know if any other team in Major League Baseball has done a better job at this than the St. Louis Cardinals. 25 players on the roster. Currently, 17 of them have been drafted (or signed from another country, but let’s not get overly technical here) and developed in the Cardinals’ minor leagues. That does not even include David Freese or Adam Wainwright (both received in trades early in their careers) who did the majority of their player development in the Cardinals farm system. Thus, somewhere between 68% to 76% of the current roster consists of “farm fresh” talent. That number could rise even higher by the end of the season with Oscar Taveras, Kolten Wong, and John Gast (update 1:03 PM EST, 5/12/13: since writing this post, the Cardinals Twitter account has said that Gast has been called up to replace Westbrook who was placed on the 15-day DL) all lingering at the Triple-A level salivating to get their shot in the Big Leagues. That percentage is staggering. If compared to any other contender in the MLB, I can almost guarantee that the Cardinals’ percentage is higher. One of the best things about homegrown talent is that a team can have a player for his early years without having to pay him the premium prices that quality free agent players demand in order to sign with a team. For example, the Cardinals have had David Freese produce (when healthy) quality statistics for parts of 4 seasons now. He has also provided a 2011 World Series MVP performance to help lead the Cardinals to their 11th championship. He did all of this while being paid less than $1 million per year–quite the bargain. I realize that if he picks it up this season (keep in mind he is playing through a sore back which is most likely contributing to his slow start) he will be due a hefty raise in order to lock him up long-term. However, the point is that the Cardinals have had him at the Big League level for 4 seasons now and have paid less than $5 million total for his services. In order to get production like that elsewhere (whether through free agency or the trade market), it would cost the team much more. Another benefit to having a roster full of players who played together in the minors is the team chemistry and friendships they develop along the way. As referenced in my previous blog post on Jon Jay and shown in the picture above, there is a core part of the team that consists of best friends, not just teammates. 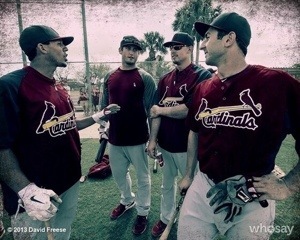 Jon Jay, Allen Craig, Daniel Descalso, and David Freese are always hanging out before, during, and after the game. They share laughs and celebrations and provide supportive foundations for each other if needed. Why are they so close? They grew and developed together. They shared long bus rides with each other in the minors with one goal in mind–to make it to the Show. Now that they have made it, their camaraderie has carried over and flourished for the Cardinals. They have had such a positive impact on team chemistry as a whole that they have even gotten veterans to participate in things such as “High Sock Sundays” and the celebratory high-five line in the dugout after home runs. At the end of the day, baseball is a game, and players are at their best when they are enjoying what they are doing. Thus, I praise John Mozeliak for how he has built the Cardinals. He has been able to use money more efficiently by developing draft picks (instead of trading them for higher-priced veterans) which has allowed him to sign franchise cornerstones, Yadier Molina and Adam Wainwright. He has also helped put together a team that truly enjoys playing with each other–something that is crucial considering the length of the baseball season. Fans cannot forget the work that Jeff Luhnowdid for the Cardinals as the Vice President of Scouting and Player Development as well. I wish him all the best in Houston, and I truly believe he has the ability to get that franchise back to its glory days–which is fine with me now that they have been moved from the NL Central. This entry was posted in Allen Craig, Carlos Martinez, Daniel Descalso, Fernando Salas, Jaime Garcia, Joe Kelly, Jon Jay, Lance Lynn, Matt Adams, Matt Carpenter, Pete Kozma, Seth Maness, Shane Robinson, Shelby Miller, Tony Cruz, Trevor Rosenthal, Yadier Molina and tagged Baseball, MLB, St. Louis Cardinals by stlcupofjoe. Bookmark the permalink. Nice insight. A aspect of the Cardinals club that many do not realize. Well put Joe.